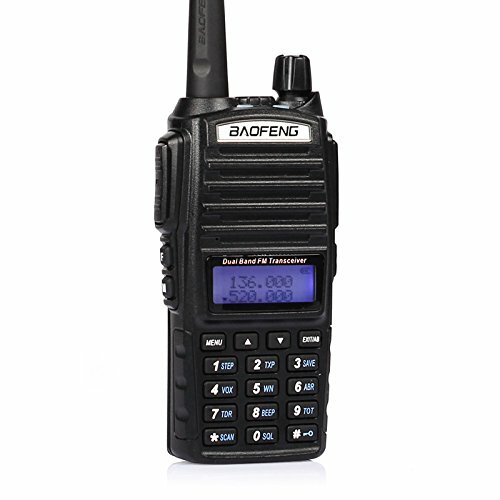 Baofeng radios are cheap/inexpensive radios manufactured in China. They definintley do not have the frills and feel of a quality radio specifically designed by one of the top amatuer radio manufacturers, but they are an inexpensive way to get on the air. These radios have opened up amateur radio to a whole new income level of hams. Back in 1992, I was just 17 years old and picked up my ticket through the Boy Scouts and a great local Elmer Dasn Sherwood, W6DAS. I am terrible with names, but I remember Dan and appreicated his ability to teach me amatuer radio. My dad got his ticket at the same time. Getting your ticket was one thing, but getting a radio and getting on the air was a completely different story! The place to go was Ham Radio Outlet, so my dad and I made the 2-your trek down to Burbank, CA and picked up an Alinco DJ-F1T. The price tag on that radio was $325 and it was a 2-meter only radio! Adjusted for inflation today, that would make it about $550, much more than my pizza delivery job provided in a week. My dad had to form the money over and we only got the one radio. It would be 5 years before I could afford my first mobile, a Kenwood TM-733a. These little Baofeng radios can be picked up for just a fraction of the cost. I believe it should be the goal of every radio operator to buy quality equipment. The quality equipment will sound better, get out better, receive better, and last longer. This is not that radio, but it does have it's use. If you need a temporary entry band radio, a knock-around radio, or a spare somewhere, this can do it. I would not rely on it the only radio I ever owned, though! Baofeng Radios are Part 90 certified (150-174 MHz and and 450-515 MHz). There is no such thing as a Part 97 certification, just Part 15. When a radio gets a Part 90 certification, it is also getting Part 15, which makes them legal in the amateur bands. This is why it is legal to buy the Motorola, Kenwood, etc radios that are coming to the second hand ham market after years in government or commercial serive. You can use these as amateur radios. That being said, you cannot use them for FRS, GRMS, or MURS as their actual design make them not eligible to be certified for use there. What you end up having is a radio like your amatuer gear after performing the wide band transmit modification. You must be very careful with a radio that has the ability to transmit outside of the area that you are licensed or otherwise permitted to transmit. The radio will not save you from tranmsitting illegally. This is up to the individual user. I write this review after having owned a Baofeng UV-5R for a couple of years (it sits on my desk at work). I also own, by way of HTs, an Alinco DJ-29T, a Yaesu VX-6, and a Yaesu VX-7. I recently bought 6 of these UV-82 radios. Purchasing 6 was even cheaper than buying that original HT (adjusted for CPI)! They sit on a shelf here and are ready to go for the rest of my family. My wife is a ham and my four kids all know they need to get licensed before they can drive. I also have a cache available for that big event that is always predicted to occur someday soon. The UV-82 is an upgrade from the UV-5R boasting a larger speaker form factor, and PCB board. These radios can be field programmed and they do have a VFO. Hams are no stranger to the VFO, but this is a peculiarity for the commercial/public service world. I believe the best and most efficient way to program these radios is to use CHIRP. Don't even try to use the software that comes with it. This will also mean that you will need to purchase a programming cable. Once I got one radio code plug created, I could clone it to each of the other radios. I actually have several code plugs for several different scenarios and uses so reprogramming is also a snap. What I love about this particular radio is the dual monitor and dual transmit switch. I enjoy listinening to two different channels at once Then, to transmit, I simply rock the PTT up for the "A" band or rock down for the "B" band. I like to add the tone at end of transmission to all incoming transmissions on the "B" band so I can tell which band is active without having to look. That way you reply on the right channel. There are only 128 channels available here, so you must be conservative on the channels you program in. You can program in the frequency and a channel name, but you cannot display both at the same time, a feature only becoming available on my high end HTs now. The UV-82 is dual band, available at 2m/70 cm or the 'X' model as 2m/1.25 m. I actually bought two of these by mistake, so be careful which model you purchase. For a quick knock around radio or when you need a gang of radios, this is a recommended choice. If you are considering purchasing one of these radios, please consider using Amazon from the link below and help support repeaterbook.com. Very inexpensive and readily available. Easy to program with CHIRP software. Transmit and receive audio quality is adequate. Can be tough to field program. Many users report quality issues with humming on transmit. Depends on the radio received. Knock off programming cables can cause havoc with Windows. Get the real cable, not the counterfeit. Approved for use on 150-174 MHz and 450-512 Mhz. As an interesting factoid reading the FCC material above, you may see a slow down in the number of these new Chinese radios coming to market. The FCC is requiring all Part 90 radios to be 6.25 Khz (or equivlent) capable. This means the radio must have a digital component, like P-25, which will drive the cost up. Unless the industry obtains another waiver from the FCC, this may be the end of the line for nre models for a little while.